you can get all working again be the result might be messy. he examples in my AD series will most of the time not work, most of the things discussed will not seem to be there , so if you did not do AD in PowerShell all seem very strange, and it will be hard to follow. I will explain what has happened and give the ways to solve this. First, the PSbase is hidden, so you need to be a more advanced PoSH user and know about it. Get-member does give misleading info, I think I got the BaseObject here memberset ?. Looks OK but ... where is it ?? Property 'displayName' cannot be found on this object; make sure it exists and is settable. also this is ofcourse very dangerous, as it does only work sometimes. So you see this makes working with AD interactive very errorprone, and lots of extra troubles and gotyas to take care of, and I hope that this will be solved for RTM as I think this makes PowerShell AD support much worse opposed to better,and lots of boilercode making scripts harder to read. I realy wonder how they came to this and if they did eat there own dogfood on this one, as I can not get what they see as improvements for this wrapper. but for AD please give me only the [ADSI] shortcut, and remove that wrapper again, as said and shown I think this makes it even harder for starters in PowerShell to explore AD. So as you could see in last post I got started with IronPython for AD management also, it is a lot more clear as current solution in RC2, as dir() does show all directly , but as PTY is limited (no tabcompletion) but we have dir() next to the PTY examples (as we have no tabcompletion and PowerShell commands(direct see PowerShell Memo links) in next post I also will work out loading the IronPython DLL to work with it from PowerShell and embed it inside a script using a here string in and add some more AD stuff, also I look into the Event Form and Thread support in IronPython and how to borrow this functionality from IronPython to extend PowerShell. be sure to take a look, only the code samples impressive enough and will get you going or you can use Google to translate. We did change the ADSI implementation. 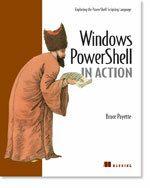 Please see my blog http://blogs.msdn.com/arulk for using ADSI. The reason why methods doesn't show up is because the objec that you point might be implementing many different ADSI interfaces. WE are planning on fixing this in our next release. I will try to go through your ADSI blogs and try to show how to do it in the new syntax. ADSI adaptation is based on how ADSI is used in existing scripting languages. and things are fixable,but much less easy as in RC1. especialy for beginners and interactive use. also to mimic that old scriptinglanguage, then I was so glad to leave behind, looks like a bad idea, also we had the Invoke Method for this. this glidepath goes the wrong way, back to looking up again,also as it works different a the SDK does state, more confusion. Nothing about a domain name for me to work with. Given that I like many SA's are scripters who learn by copying from others it would be great if you could qualify some of the leaps in knowledge for us. You get the output of the type. I walked through much of your experience with this article. Still not sure about PsBase. It seems to be there and not there depending on the path of access. I suspect the next release will sort this out. Anyway - WOW you are doing a great job of sorting through getting ADSI to work in PowerShell. I don't care much for this implementation, either. Now I have to wonder what form the MMC generated code will take, and what consequences this may have for the promised AD Provider in V2. Have you figured out how to get a recursive list of computers? I can get any info from an individual user/machine if I already know the name, but that isn't very useful in a large environment.